What You Should Look for in a Supplier Diversity Solution:This checklist provides direction in choosing supplier diversity software. Topics covered include supplier discovery, data enrichment, Tier 2 reporting, and strategic services. 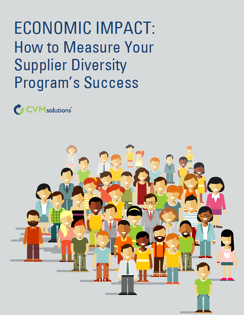 Economic Impact: How to Measure Your Supplier Diversity Program’s Success: This white paper examines the importance of supplier diversity to the community at large. Topics include why economic impact matters, how to measure your organization’s impact on the economy, and why those measurements are important to key stakeholders. For additional information about these supplier diversity resources or CVM’s services, visit the company’s website at www.cvmsolutions.com.